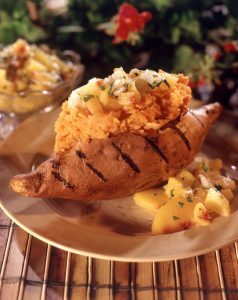 Wash sweet potatoes and place in microwave. Cook on high 3 minutes. Rub outside of skins with butter or vegetable oil. Grill over medium hot coals until fork tender, about 8-10 minutes, turning frequently so skins won’t burn.